You can create a quiz question that involves a formula with a single variable. Based on the variable and formula definitions, the question could change for every student. If you need help adding a mathematical formula in the Rich Content Editor, please see the Math Editor lesson. If you need help building formulas in the Formula Definition field, see the Canvas Formula Quiz Question Helper Functions PDF. To negate an expression in the Formula Definition field, multiply the function by -1. For example, type -1*sqrt(5x). Click the drop-down menu and select the Formula question type . Type the question prompt text and formula with variables in brackets in the Rich Content Editor . You can include video, images, math equations, or flash activities. Click the Need help? link  for more advanced options. Note: If you need help adding a mathematical formula in the Rich Content Editor, please see the Math Editor lesson. You cannot use the letter "e" as a variable. It is a reserved mathematical constant. After you have finished typing the formula in the Rich Content Editor, parameters to define the formula will appear. Set the variable definitions for the formula. Specify the minimum and maximum numbers for variable X . Setting a minimum will prevent a division by zero. 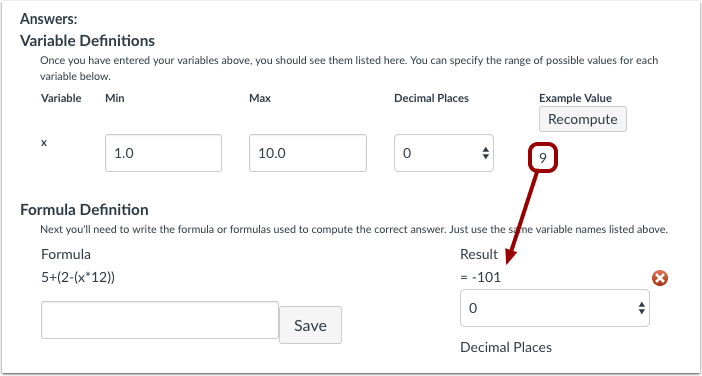 Select decimal places in the drop-down menu , and click the Recompute button  to verify that Canvas will insert a number into the formula that is within the variable definition. Type the formula definition in the formula field . Make sure the formula does not contain any brackets or equal signs. Select the Decimal Places drop-down menu  to set the number of decimal places you want used for the result. Select the Save button to save your formula . 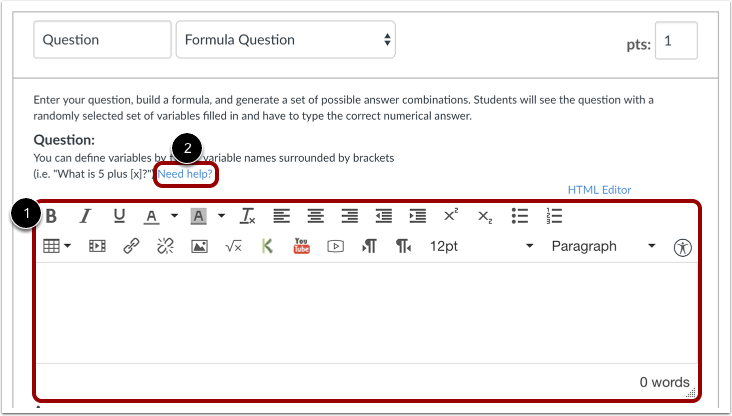 Note: If you need help building formulas in the Formula Definition field, see the Canvas Formula Quiz Question Helper Functions PDF. Once you've added a formula definition, you can go back to the Recompute button and watch the calculated variable process through the formula, creating the result. You can recompute as many times as you'd like. For instance, in this example, the number 79 acts for x and the result is -941. 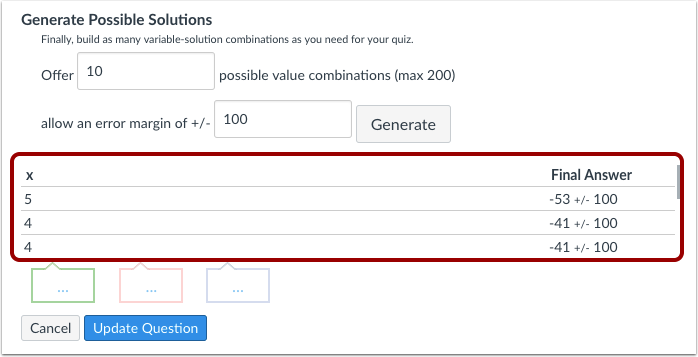 In the Offer field, specify the number of possible solutions you want Canvas to generate . In the error margin of field, enter the margin of error for the student's answer . Responses are based on relative error in addition to absolute error. Margins of error can be created as a percentage or as a point value (up to three decimal places). Click the Generate button to view final answer . Possible solutions will process according to the number of value combinations. You can provide feedback for the question by clicking an answer comment field and entering text. The comment fields are color-coded to correspond with the type of answer the student provides. Green is for correct answer feedback , red is for incorrect answer feedback , and blue is for general question feedback . This is what students see when they encounter a Formula question in a quiz. If you allow students to see the correct answers, they will see the correct responses listed after their answer. If you allow students to see the correct answers, they will see the correct responses listed after their answer. If the student got the answer incorrect, a red flag will indicate the answer was incorrect. Previous Topic:How do I create a Numerical Answer quiz question? Next Topic:How do I create a Simple Formula quiz question? Table of Contents > Quizzes > How do I create a Formula quiz question with a single variable? Re: Can I use a user-entered response in the answer formula for a Numerical Question?